Edwin Tomkins was the third of the five children of Rev Thomas Tomkins (c1761-1839) and Mary née Messiter. He was born about 1791 at Blackford, near Wincanton and in 1798 his father was recorded as living in North Cadbury. Edwin had two older siblings; John and Thomas, and two younger siblings William (1799-1855) and Letitia (1808-1876). 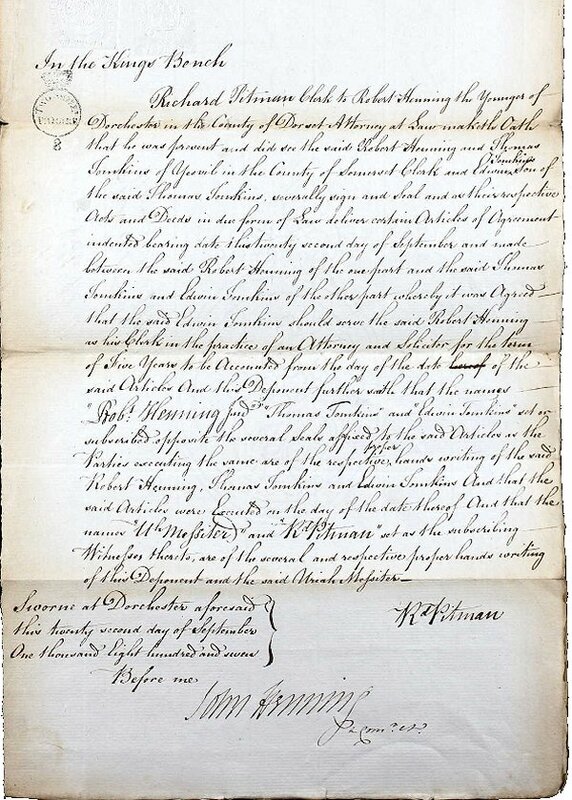 In 1807 Edwin was articled to Attorney Robert Henning of Dorchester, Dorset. In 1824 Pigot's Directory recorded Edwin as an 'Attorney of Kingstone' in Yeovil. In 1831 there were riots in England when Parliament decided against reform to give Britain's industrial cities and towns better representation. Many of the solicitors in Yeovil were active anti-Reformers and had been professional election agents of Lord Ashley. Consequently they were the first to be singled out by an angry mob on the night of Friday, 21 October 1831, in what was to become known as the Yeovil Reform Riot of 1831, who attacked the home of Edwin Tomkins and also the homes of his brother William, Edwin Newman, Francis Theophilus Robins, William Lambert White and John Slade. In 1832 the Poll Book of Milborne Port recorded Edwin Tomkins of Yeovil by virtue of owning 'a freehold garden' in Kingsbury Regis occupied by H Feaver. However Yeovil's Poll Books of both 1832 and 1834 listed Edwin by virtue of owning a freehold house in Hendford, while his brother William, a surgeon, was listed as owner of a freehold house in Kingston. The Somerset Gazette Directory of 1840 listed Edwin as an 'Attorney of Hendford', which was repeated in Hunt & Co's Directory of 1850. Although listed in Hendford, Edwin's home and law practice was actually in today's Princes Street - although I should, perhaps, explain. In the 1850s what is today's Princes Street went by a variety of names. It was colloquially and sometimes officially referred to as 'Cattle Market' until around this time when the upper classes were taking over, but the street actually fell within three manors; Yeovil Borough, Hendford and Kingston. From today's junction with Westminster Street (at the time known as either Porter's Lane or Custard's Lane depending on who owned the bookshop on the corner at the time) as far as Old Sarum House on the corner of Park Road, the western side of the road was called Hendford because it was originally in the manor of Hendford (and, indeed, was a continuation of Hendford that starts at Hendford Hill). Beyond Park Road the western side was in the manor of Kingston and the western side was called Kingston. From about where Court Ash joins, both sides of the road was Kingston as far as the Five Crossroads. Now, coming back along the eastern side, between Court Ash and North Lane was officially Kingston but, confusingly, is invariably referred to as Hendford. From North Lane to Church Street the eastern side became known as Princes Street from around the early 1840s but was occasionally still referred to as Hendford (hence Edwin's practice is usually referred to as in Hendford, but technically wasn't). The eastern side from Church Street to High Street was in the manor of Yeovil and was known as either Cattle Market or Princes Street. From about 1850 onwards the whole gradually became known as Princes Street but the earlier names for the different parts weren't finally dropped until around 1870. Having said all that, Edwin's home and law practice were at today's 44 Princes Street. A lifelong bachelor, Edwin was listed living there in the 1841 census with his younger sister Letitia, her husband Francis Oakley and their two sons Edwin and Moulton, as well as a male servant and a female servant. Edwin probably needed a male servant since he was blind from about 1838 and his brother-in-law, Francis Oakley almost certainly helped in the law firm as in the following census he gave his occupation as 'Attorney's General Clerk'. In the 1861 census Edwin, Letitia and Francis were living at 44 Princes Street with Letitia's four children and a male and female servant. 70-year old Edwin listed his occupation as 'Retired Solicitor' and Francis gave his as Accountant, so it would appear that Edwin's law firm ended with his retirement. Edwin Tomkins died on 1 December 1861 at Yeovil and his will was proved the following April by Thomas Tomkins (his older brother) of Piddletrenthide, Dorset, Gentleman. Edwin's effects totalled 'under £1,000'. Edwin Thomson's articles of clerkship to Robert Henning, dated 2 September 1807. 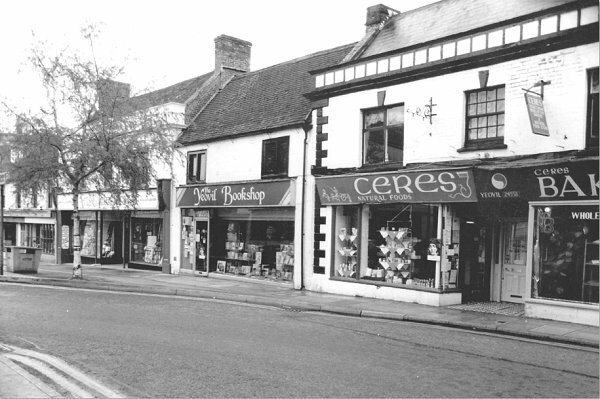 Edwin Tomkins home and law practice was in the building used by the Yeovil Bookshop in this photograph of 1990.